In the beginning, there was the word, and the word was Tintin. Steven Spielberg didn't know what it meant. "Raiders of the Lost Ark had just opened overseas," he says, "and all through the French reviews, which I couldn't read, there was a smattering of Tintin everywhere. I didn't understand what Tintin meant in French, or what that was referring to." Tintin is, of course, the first and only name of the indefatigable, incurably innocent boy reporter who has sold upwards of 200 million books worldwide since he first appeared in a comic strip in 1929  though he's somehow managed to do this without making himself a household name in the U.S. The French critics had a point: Tintin's globetrotting adventures are similar to those of Indiana Jones. Once this was explained to him, Spielberg hunted down his very first Tintin book, which happened to be The Seven Crystal Balls. He still didn't understand the French, but he understood Tintin immediately. "It was like a movie, with beautifully rendered storyboards," he says. "I understood the story, I understood the humor, I just got it, without having to hear the words." At the time  this was 1983  Spielberg was in London making Indiana Jones and the Temple of Doom. He called up Hergé, Tintin's creator, who was 75, to talk about making a Tintin movie. "He'd seen Raiders of the Lost Ark and loved it," Spielberg says, "and he just committed, at that moment, that he wanted me to be the director to turn his stories into films." (This is Spielberg's account; Hergé's biographer, Pierre Assouline, tells a much longer story involving a lot of legal wrangling over contracts.) Plans were made for Spielberg to visit Hergé in Brussels a few weeks later, but before that could happen Hergé died. Spielberg acquired the rights anyway, from Hergé's widow, but there were script problems, and he had a lot of other movies to make, and the project stalled. It would be nearly three decades before Spielberg brought the comic-book hero to the screen: The Adventures of Tintin opens in Europe in late October, nearly two months ahead of its U.S. release. It's either touching or ironic  or a bit of both  that Tintin should be making his big-budget, big-screen debut at a moment when grave economic woes threaten the great pan-European dream. Tintin is the pan-European hero par excellence  he was pan-European before there was a pan-Europe  and far from fading away, he's about to take a shot at going global, albeit with the help of an American and a New Zealander. Tintin didn't start out as pan-European, let alone global. He started out as Belgian. Hergé was the pen name of one Georges Remi, who was born in 1907, the son of a worker in a candy factory in Brussels. He grew up a Catholic and an ardent Boy Scout. He began publishing Tintin's adventures in a Brussels newspaper, and they were an instant hit: at the end of Tintin's first adventure, a trip to the Soviet Union, the newspaper threw a welcome-back party at the train station. Thousands of fans showed up and mobbed the hapless Tintin stand-in, a local Boy Scout with his hair gelled up into Tintin's trademark ginger quiff. It rapidly became clear that Tintin was destined to escape from his humble beginnings as easily as he shed handcuffs in the comic books. 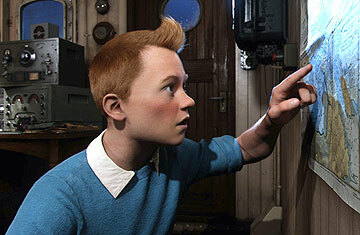 Tintin's story would eventually be translated into 60 languages (he is Dingding in Chinese and Tincjo in Esperanto). He has been adapted for the radio, the stage, TV and the movies, though never on a grand scale. There are Tintin stamps and a 10-euro Tintin coin. The first comic strip to enter the modern-art collection at the Centre Pompidou in Paris was Tintin. A bronze statue of Tintin and Snowy stands in a square in Brussels. Apart from his determination and ingenuity, Tintin barely has two character traits to rub together, but that's part of his charm too. He's Everyboy. His age is hard to pin down: he looks like an adolescent, but lives by himself and doesn't go to school. It's even harder to figure out where and when he lives: the world he inhabits is recognizable as generically European, with green swards and quaint cities and tree-lined thoroughfares, and belonging to some moment in the early 20th century, but you'd be hard-pressed to stick a pin in a map, or a calendar. He has no ego and no politics beyond a visceral dislike of unfairness. He has no family or romantic attachments. He's a reporter by profession, but unlike, say, Clark Kent, you rarely ever catch him doing any reporting. He barely has any facial features. Tintin is relatable to a fault: it's easy to imagine yourself as Tintin, whether you are in Cologne, Caracas or Kolkata. See TIME's special report "Summer Entertainment Preview 2011."